Lima -- Peru's foreign minister has accused Bolivian President Evo Morales of being an enemy of Peru. Jose Antonia Garcia Belaunde's remarks followed Peru's withdrawal on Tuesday of its ambassador to Bolivia. That move, on Tuesday, was a response to Mr Morales's remarks about violent clashes that have erupted in Peru over Amazon land rights. 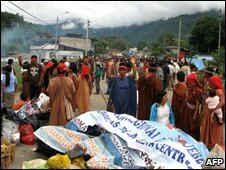 Mr Morales described the deaths of indigenous protesters in the dispute as a genocide caused by free trade. The Peruvian foreign minister's response marks an escalation of tension and bad feeling between the governments of the neighbouring Andean countries. 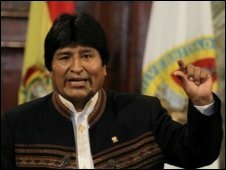 Mr Garcia Belaunde said the Bolivian leader appeared to believe he had a messianic role to play in liberating Peruvians from the government of President Alan Garcia. Mr Morales's comments on free trade appeared to be a reference to Peru's bilateral treaty with the United States, which facilitated the decrees that the native Amazonians believed to be a threat to their lands. At least 34 people were killed when police attempted to clear a roadblock of indigenous protesters this month. President Garcia blamed foreign forces - widely believed to mean Bolivia and Venezuela - for inciting the unrest. Mr Garcia Belaunde reinforced that allegation, saying there were many indications that Bolivia was behind the violence in Peru. Some experts say the relationship between the two countries has never been so bad.